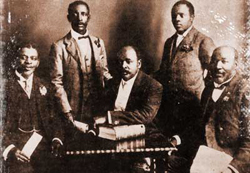 After actively petitioning the National Convention and being ignored during 1910 and 1911, delegates to the South African Native Convention (SANC) decided to call a meeting in Bloemfontein on 8 January 1912 to consider the formation of a dynamic and unified movement that would challenge the White government. The outcome was the formation of SANNC. The inaugural conference was organised by Seme, Alfred Mangena, Richard Msimang and George Montsioa (all lawyers educated abroad). Seme wrote an article in October of 1911 called ‘Native Union’. In it he proposed an agenda for the inaugural conference, pasted in the box below. Resources are unclear as to whether this exact agenda was used at the conference. The chief business for their important deliberation will, for convenience, be divided into two sections. •To formally establish the South African Native Congress as a National Society or Union for all the Natives of South Africa. •To Consider, amend, and adopt, the Constitution and Rules for the Society, Union or Congress. •To elect Officers for the ensuing year. •General the Right Honourable Louis Botha, P.C. •The Honourable the Minister for Native Affairs. •The Honourable the Native Senators. •Native beer, is it a national beverage? •The Black Peril and White Peril. •Native Courts ”” civil and criminal. The conference took place on 8 January 1912 at Maphikela House in Mangaung Township, Bloemfontein. Of the group of delegates that met, the Transvaal was the best represented with 25 delegates, while a few influential people, including John Langalibalele Dube and John Tengo Jabavu were unable to attend (see list of delegates who attended the conference). The SANNC was founded at this meeting. J.T. Jabavu, the founder of ‘Imvo zaBantu’ (a mouthpiece for the new Elite's political thinking in the Eastern Cape) was opposed to this move. He described it as a ‘dangerous delusion’ in that it preached that Africans should have nothing to do with White institutions. Rev. John Dube was elected the SANNC’s first president at the conference in absentia, Plaatje was elected Secretary-General and Seme was elected Treasurer-General. Although the contents of the constitution were not radical, there was no agreement on it and was only finalised in 1919. The SANNC was an elitist rather than a mass movement in its early days, and consisted of members with an education or a position in the community. Much like the African People's Organisation (APO) and the Natal Indian Congress, exclusivity along the lines of colour were also a norm and women were not initially permitted to be members.